Puro’s social sharing related settings. 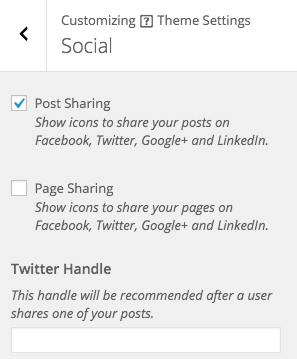 Show icons to share your posts on Facebook, Twitter, Google+ and LinkedIn. Show icons to share your pages on Facebook, Twitter, Google+ and LinkedIn. This handle will be recommended after a user shares one of your posts. If you’re using Puro Free and would like to review the premium offer, navigate to Appearance > Puro Premium from within WordPress.